My mum just tried out Erin Erickson's Two Zip Hipster sewing pattern and sent over the result. And now we have a problem on our hands, because I love it so much I want a dozen of them in different fabrics. Is that greedy? It's my new favorite bag design. It's got a zipper closure so no worries about your wallet falling out. There's a pocket on the inside, plus two more on the outside. The 9" x 11" size is exactly what I like in a bag. Just big enough to fit a book and an iPad, yet trim and not bulky. 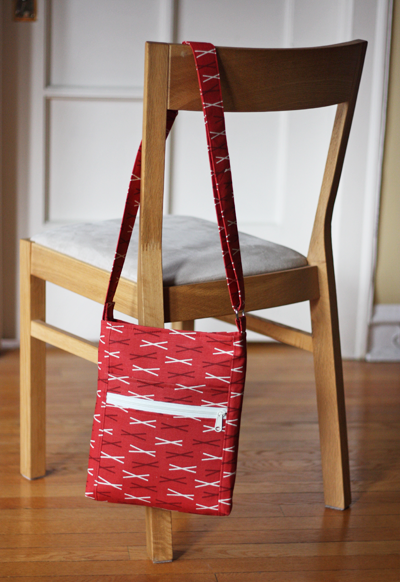 And the strap length is adjustable so you can carry it over the shoulder or wear it across your body, messenger bag style. "This pattern looks intimidating at first glance because it contains 32 pages, 17 of which are pattern pieces. But not to fear! Those 17 pattern pieces, when cut out and taped together as instructed, amount to only 9 actual pieces. The remaining 15 pages contain a LOT of photos, which are labeled and have notes to point out what the written instructions mean. Every detail is explained very clearly, so even if you're a beginner sewer, you'll be able to make this bag. The bag has two zippers. 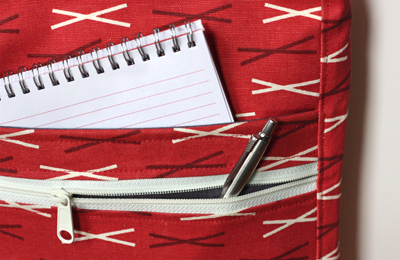 If you're afraid of zippers, your fear will be gone after sewing this bag. They're so easy with these instructions, and they look professionally done. One of the things I liked best about making this bag was cutting it out (which I normally hate). Every single piece is a rectangle, so with a cutting mat, ruler and rotary cutter, cutting was a breeze. The VERY best thing I liked, though, was the bag itself... I love it! I will definitely be making more of these. Thanks, Erin, for an excellent pattern!" So yeah. If you sew, you probably ought to buy this pattern. It's a PDF you can purchase and download right here from Erin's pattern shop, Dog Under My Desk. Have fun sewing! Update: Erin has now added tips for making an optional iPad pocket. Another update: Mom made another one! That bag looks perfect! Just the right size for shopping trips and quick outings. I'll have to get that pattern. That is an excellent bag! I love the pro finish to it. Best news is I may just have enough outside Oslo left from my 2-4-1 bag to make this one! Thanks for the review (nice job Mom). P.S. Thanks, Poppyprint! Have fun making yours! Can your mum start an Etsy shop so non-sewers like me can buy that fabulous bag? Love the pattern AND the print, obviously. Oh my gosh, thank you SO much for sharing your experience with this bag, I totally think I will make one!! i love that. not a big sewer but I'd buy that. Fabulous! One request -- I would love a photo of how the bag looks "on." Alexis, there's nobody else here, so this weird photo I just took in front of my bathroom mirror will have to do! Gorgeous bag!! Have you seen Pantone´s Color of Year for 2012 pick...I am sure you will just LOVE it!!! How cute is that? I love it, so professionally done. I love your mom! You need to make her pattern reviews a regular feature here. :) I actually purchased the pattern of the last bag she made you during a $.99 sale at JoAnns. Wonderful!! Your mum is very talanted. Love her fabric choice! i would never have given that pattern a second glance before seeing a picture of it in outside oslo! now it's on my wishlist (along with outside oslo fabric...). 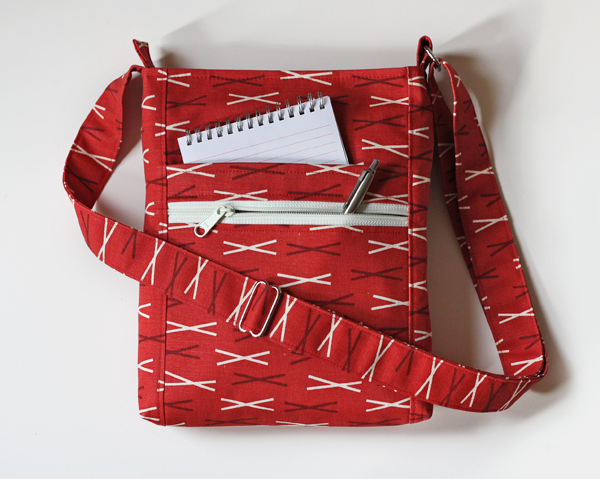 loved your mom's review about the pattern being good for beginners as well! I want one! :) Sadly, learning to sew is not on my agenda any time soon. 1. Thank you, everyone, for your kind words! 2. Nanette... sorry, but we already tried the Etsy thing. We're done with that. 4. LeeAnn... thanks for loving me! :) The pattern reviews would be a little more regular if I weren't so slow. ;) Congrats on your bargain purchase! Did you make the bag yet? 5. Able Mabel... my boss dictated the fabric choice! Okay, we really agreed on it. But I just love that designer! Totally agree with LeeAnn -- love Grandma G's reviews! Especially love that she indicates whether or not patterns are appropriate for beginners, since that's what I am! Would normally be intimidated by a pattern like this, but with your mom's words, am ready to try it! Mum, well, to take this photo, I used a special technique where I stood on my tiptoes and backed up until the glass shelf opposite the mirror pressed into my shoulder blades. I love the bag. I love the fabric. I love your mom. But I misread the title, and then spent a few minutes trying to figure out--do you put the hamster IN the bag? Do you zip TWO hamsters in the bag? And variations. I just laughed out loud. Yes, I believe Erin's next pattern should be a Two Zip Hamster bag. Looks great! Love your fabric choice, too, what is it? Ah! That is the bag I've been looking for! Also, using your post, maybe I can try to convince my mum that this pattern is meant to be sewn by mums for their daughters... Do you think that'll work? I'm so glad for the review. I've looked at this pattern and wondered about it. Looks like the perfect thing for carrying my book reader! Wendymoon, the fabric is the Sticks print in Dawn from my Outside Oslo fabric line. Nina, I believe so. Here, let me help. Nina's mom, please make this for Nina. Pleeeeeease? Love it!! Hmmm a project for after Christmas perhaps?? This bag is really cute! It does look like a very useful size. How nice of your mom to sew it up and review it for your blog! Grandma G- I am taking some time off work surrounding the Xmas holiday and plan on sewing the bag then. I wanted to use leather for the bottom corners of the bag, and just last week was able to thift a leather skirt for $2.50 to use! All systems go! Way to go, LeeAnn! Note that there are better ways to make those straps! I absolutely love how it turned out in your fabric. I just ordered some of the blue and red! 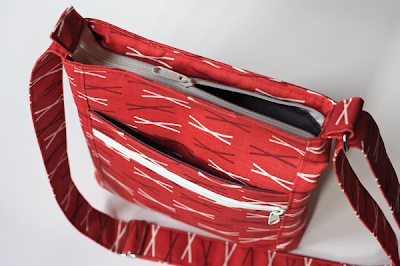 Thank you so much to Jess and Grandma G for reviewing my pattern! I'm so happy that you liked it! Love this pattern but really love this fabric!!!! I really love the look of that bag and want one for myself. One small problem, I have tried to figure out how much 0.5 yard is...? Google and conversion tables tells me its around 45cm and I am guessing that is the length of the fabric? How wide does the fabric have to be as most fabrics have a different range in width size. Not sure where you got the .5 yard from. The pattern calls for 1 yard of main fabric and 2/3 yard of lining fabric. You'll need the whole yard (length) to make your straps. It needs to be 42" or more wide. Hope that helps! Materials needed specified only 0.5 yard of material for the outside fabric. That was listed on the website itself. The purchased pdf specified 1 yard of fabric. Thanks for sharing. That is a great bag. Went to the site and now I'm sewing ear bud bags for little xmas extras. Will have to sew for me after the holidays! that is am=n amazing bag, love it!!! Love your bag! Just want to double check it fits an Ipad - my daughter needs one for school next year & I think this is the perfect bag for her to carry it back & forth to school each day. Anonymous... yes, it does fit an iPad. 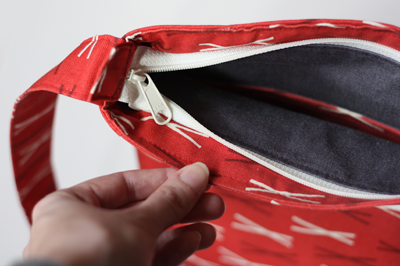 But if you go to Erin's blog, she explains how to add a pocket specifically for the iPad! That bag looks an excellent .. Thanks for the tip Grandma G - looks perfect! On my way to purchase the pattern. Have a blessed Christmas! A tip for anyone making this bag - definitely use a size 18 needle! I broke 3 size 16's, stuffed the tension & now my machine is off to be fixed - it was not happy sewing through so many layers! The good news is I scored a new Janome Horizon & the bag finished up a treat! Hmmm... I believe I used a size 14 needle without any problems. Carefully, of course. But with the home dec weight OO fabric, I didn't use the fusible interfacing, only the sew-in called for. Maybe that was the problem? Thanks for the review! 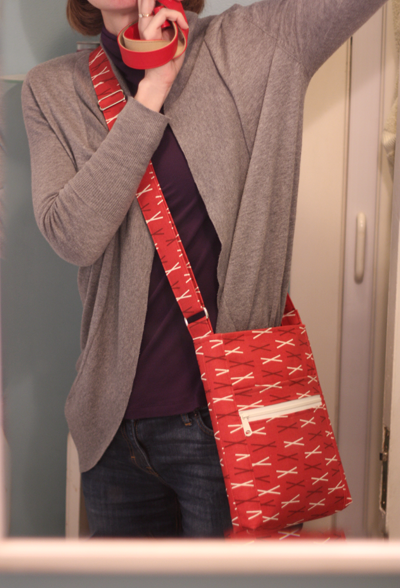 It gave me the courage to buy the pattern and make the bag! I have made ten of these bags now and I love each and every one of them. Good thing I don't keep all of them! I used the Sharptex needle recommended and did not have any issues sewing through all the layers! Ditto the etsy shop recommendation. I have been looking for a bag like this but I don't see well especially anything with zippers. Please have your mum make a lot and sell them!!! I just finished this bag yesterday, and bought the pattern upon your recommendation! I love it! My machine did have a little trouble with some of the layers and the fusible interfacing, but she slogged through it! I love the zipper instructions, and am definitely over my fear of zippers! Yay! Congrats on your new bag! I've got to have this pattern. This bag is perfect for my needs. I want this pattern... how can i get it? ?